"... I have never seen a group of children laugh and enjoy themselves more. It was a truly special event for all of us and I thank you for your sweet, funny & engaging show. I have posted a recommendation on the Berkeley Parents Network. ..."
"The mission of Lincoln Child Center is to enable vulnerable and emotionally troubled children and their families to lead independent and fulfilling lives. Joe and his stories of triumph and hope as told by his Caterpillar Puppets, laid an excellent foundation for that mission to be fulfilled." "The Itty Bitty Variety Show was a smash success! I booked the Caterpillar Puppets because the Performer Directory that we have at the Library showed 4 stars out of 4 for your show and you certainly did not disappoint. Thanks." "Thank you for the great show you did for us here at the El Cerrito Library on Saturday. The kids (and parents) loved it and so did I! 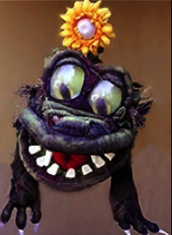 You are one of my very favorite puppeteers (and I've seen a lot of them!). 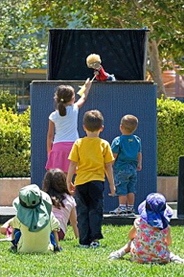 Your stage and puppets may not be as fancy as some, but your artistry, storytelling and comic timing are the best!" "One of the BEST presentations I have witnessed in over 35 years of teaching." —2nd grade teacher, Ardenwood School, Newark, Ca. 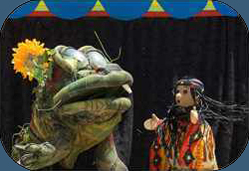 Thank you for a truly transcendent puppet show – you mesmerized every child in our large audience (over 200 children and adults) with your artistry. Our library has hosted many great performers this summer, but Caterpillar Puppets was the only one that had children – from babies to fifth graders – screaming with delight. (And it was good screaming, not bad screaming.) Thank you, and best wishes for the rest of your summer performances." "... you get more laughs and more funny mileage out of a story than anyone else."